Microdermabrasion treatments use a minimally abrasive instrument to gently resurface your skin, removing the thicker, uneven outer layers. This type of skin rejuvenation is used to treat superficial scarring, discoloration, sun damage and stretch marks. Microdermabrasion helps to stimulate cell turn over, removing dead skin and allowing for better product penetration + building collagen, resulting in a younger, more even looking complexion. Microdermabrasion is recommended for all skin types and is best in a series, spacing treatments 3-4 weeks apart. Must be avoided on skin with open lesions and those using retinol or accutane. This treatment uses a sterile, surgical-grade scalpel to carefully shave, or scrape, the top-most layer of skin and fine hairs from the face. The concept can sound terrifying, but for many it’s the secret to clear, even, smooth and fuzz-free skin. The hair will not grow back darker, and it some cases not all the hair will be removed. Dermaplaning is recommended for all skin types except those with active acne, and gets best results if done every 4-6 weeks. If you have deep cystic acne, wait until breakouts are clear before trying this treatment. This is a great treatment if you are pregnant or nursing and want exfoliation without the risk of harsh chemicals absorbing into the blood stream and potentially harming your baby. No shaving, peels, waxing or agressive exfoliations one week prior to dermaplaning treatments. You should wait 7 days after receiving botox or dermal fillers. Keep in mind this is not a hair removal technique, its focus is on the removal of dead skin cells, while it does remove vellus hairs (peach fuzz) it will not remove all facial hair. We recommend waxing or IPL for hair removal. This treatment is a process that emits infrared lights on your face in different wavelengths or spectrums. What those wavelengths are is determined by the specific kind of treatment you’re looking for from LED light therapy. When used consistently, over time, LED lights penetrate your skin at different depths and cause various reactions in your skin. The light waves that are sent to your skin actually trigger certain reactions in your skin cells. These reactions are what, in turn, gives you the results you are trying to achieve. The reactions happen at the dermis layer of the skin. Your dermis layer converts the light into a fuel of sorts that the cells then use to do its job in healing the skin. Think of LED light treatment as a way to fill up your skin’s gas tank. LED light treatment speeds up your skins ability to perform its natural functions. LED is recommended for all skin types, can be done as often as once a day and can be added to any service. Check it out in our add ons! Cupping is an alternative therapy that uses suction cups to stimulate your skin and muscles. The suction promotes increased blood circulation, which may help relieve muscle tension, promote cell repair, and aid in other regeneration. It’s also said to improve the flow of your “qi” (pronounced “chee”). Qi is a Chinese word meaning life force. 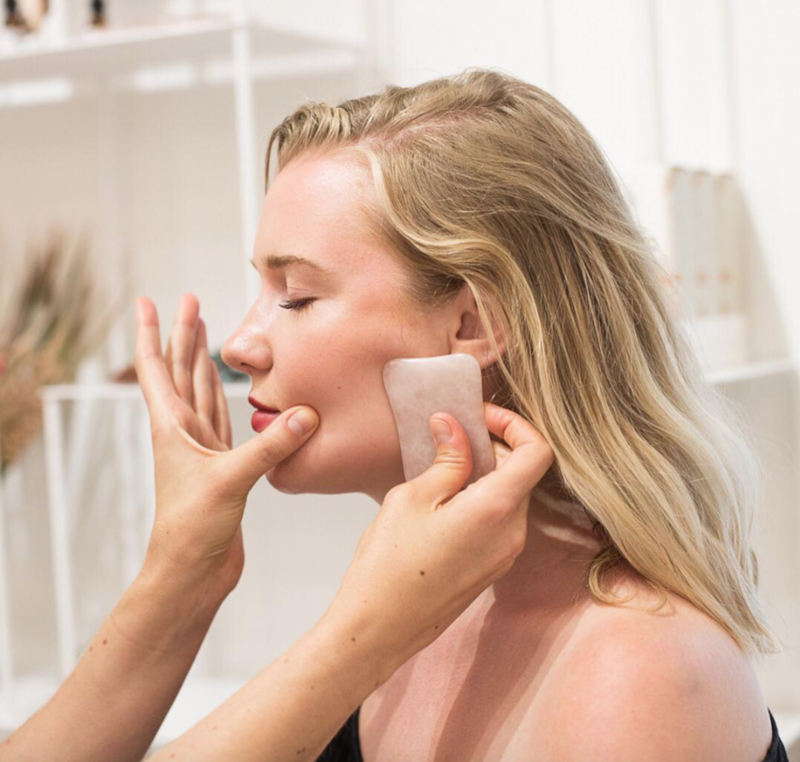 You can experiment with facial cupping at home, but it may be best to reach out to an experienced practitioner for your first session. They can answer any questions you have and may be able to offer additional guidance on your skincare needs. There’s no better way to drain toxins and stimulate lift and tightening in the skin is a professional facial. If you want to combat puffiness and infuse a little glow, You will see and feel the effects of this technique instantly. lymphatic drainage, a gentle massage that targets the lymph-nodes and drains toxins. It’s one of the most effective ways to sculpt your jawline, remove puffiness from under the eyes, and support the health of your skin. Like all circulation in the body, the lymphatic vessels drain toward gravity, which leads to swelling in the first place. Massaging upward will help improve the skin’s radiance and over time, with consistency, create a more toned look to the face. Our lymph system relies on normal, gentle contraction from our muscles during everyday activity. This technique infuses the skin with active oils, for slip and lift. We recommend the wildflower ultralight oil, facial recovery oil, or rosehip firming oil from Eminence Organics. We use a Gwa Sha tool, usually of jade or rose quarts, always start with downward motion, on the side of the neck to open the lymphatic pathways. This technique can be added to any facial. The above treatments can be added to any service to enhance its effectiveness. For best results, all treatments are best in a series. We recommend one of our Signature Organic Facials once a month for maintenance. Below are a lists of skin topics in which to focus, as well as their results. Each treatment is customized, but this might help to guide you in choosing your treatment. Did you know that most of our sun damage happens before the age of 18. Our brightening series reveal a brighter, move even complexion by noticeably improving skin tone and texture. Brightening with a resurfacing enzyme peel, AHA, microderm or dermaplaning to deeply exfoliate the skin. We use luxurious masque, moisturizer and serums to infuse your skin with Eminence Organics' lightening technology and rich source of vitamin C, to reduce visible signs of sun damage, blemish marks, and hormonal influences. Sun-protecting treatments always complete the experience of achieving flawless looking, fully protected skin. A jump start for your hormones leaves your skin refined, radiant and clearer than its been in years. The combination of nutrient rich products are bursting with goodness and active ingredients that you can feel getting to work on your skin. We use plant based estrogens to work in harmony with your natural hormones to combat those unwanted breakouts. These phytoestrogens, paired with mega antioxidant plant power is also the perfect combination for collagen production. Now who doesn't want a little more collagen? The Acne Advanced Treatment utilizes natural and botanical actives to deliver a proven organic solution for those looking to treat and prevent acne. Its our goal to understand what your skin is telling us, and be your translator. Just like any treatment this is best done in a series, so lets team up and banish acne for good. Acne is a clear sign that there is disharmony in the body, we highly recommend pairing these treatments with a Holistic Nutrition series. Repair the visible signs of aging with the advanced age corrective treatments for immediate and lasting results. Take your skin on the collagen boosting retreat to paradise with coconut, bamboo and tahitian flowers to renew and replenish your complexion. An exclusive clinically proven retinol alternative and revolutionary swiss green apple stem cell technology, lift and tighten skin, erase wrinkles and crow's feet, and increase collagen for skin that appears, and acts, naturally ageless. This treatment is concluded with the Organic and Instant Ultra Eye and Neck lift, and Line Filler. Say goodbye to problem skin and hello to a radiantly clear complexion with clarifying and calming ingredients in Eminence Organics' Clear Skin Line. Cooling cucumber tones and revitalizes skin while refining probiotics work to exfoliate and eliminate the signs of congestion. Acne prone clients typically have remarkable improvement after three consecutive facials. We specialize in out ability to gently extract the skin and also provide information about holistic approaches to help clear your skin, including nutrition and detoxification advice. With all the hidden toxins in our environment, we are more inflamed than ever before. Our anti inflammatory treatments are the cure for the inflammation that shows up on our skin. Red blotchiness, rosacea, swollen puffy eyes, allergen side effects, the list goes on and on. With active ingredients like, arnica, linden, calendula, chamomile, cucumber, and CBD in combination with treatments like cryotherapy, ice rolling, Gwa Sha lymph drainage and sinus relief… we can guarantee you’ll leave feeling like a million bucks. BUT ALL THE SERVICES SOUND SO GREAT…. We know that there are so many new and exciting advancements in the world of skincare. It can be a bit overwhelming. Don’t worry, this is our specialty! Feel free to fill out the form below and tell us about your skin and we can recommend professional services and/or organic home care products for your skin. We will follow up with you within 24 hours. Thank you for sharing, someone will be with you shortly!